Having a vegetarian over for Thanksgiving this year? Step away from the tofurky* and – most importantly – try not to fret too much! It’s more than likely that the vegetarian in your life would hate to see you go to a ton of extra trouble for him/her. Here are a few tips to keep everyone – meat-eaters, vegetarians, and the busy host alike – all happy on Turkey Day. The Thanksgiving table overflows with dishes. Sweet potatoes, squash, mashed potatoes, gravy, cranberry sauce, stuffing, rolls, salads … vegetarians and vegans, theoretically, have more than enough options from which to create a satisfying feast with nary a glance at that platter of turkey. But then we see that the Brussels sprouts are smothered in bacon drippings. And the stuffing’s got sausage in it. And the potatoes were mashed with chicken broth, and the gravy, of course, is made with turkey drippings. A roll, some cranberry sauce, and a pile of green salad – if we’re lucky – will have to do. No need to change every single family recipe or make a second set of everything sans meat – again, we hate to see you agonize over us – but why not try a new recipe for a perfectly delicious stuffing sans sausage or make the mashed potatoes with milk or veggie broth instead of chicken broth? Thanksgiving Day side dishes needn’t have meat to be utterly delicious. You’ll learn a new (and possibly healthier) recipe with hardly any additional work, and everyone at the table, no matter their dietary preferences, will still savor every scrumptious bite. If you can work in an obvious protein source like quinoa or lentils, great! But that’s just a bonus – you’d be surprised how much protein most dishes already have in them. And here’s an entire menu that should work for carnivores, gluten-free folks, vegans, and vegetarians alike. 2. When your vegetarian or vegan guest offers to bring a dish, let them! When your meatless loved one brings something to the table, it’s a win all around. It’s one less side dish for you to make – and nobody goes away with a growling tummy. Will it mess with your menu? Possibly, but oh well! This is a great time to remember that Thanksgiving dinner isn’t about the perfect menu; it’s about gathering with the loved ones you’re thankful for. Okay, fine, and gorging yourself too – but we all know you don’t need to live in a Norman Rockwell painting to do that. I know I’m beginning to sound like a broken record, but seriously: it makes most vegetarians feel bad – and possibly even more like an outcast – when the host goes to a ton of extra trouble to create an entirely different menu for one lone palate on Thanksgiving. Don’t get me wrong – we do appreciate the effort and we know it comes from a good place – but nobody likes to feel like a burden. As I alluded to in tip #1, simply including a meat-free dish or two that everyone can enjoy is ideal. My nephew loves a particular vegetarian tomato and olive pasta dish, so oftentimes my brother and sister-in-law will thoughtfully include that dish when they host family festivities. My nephew gets to enjoy a dish he loves that just happens to be meatless – and so do I (along with anyone else who wishes to partake). * P.S. 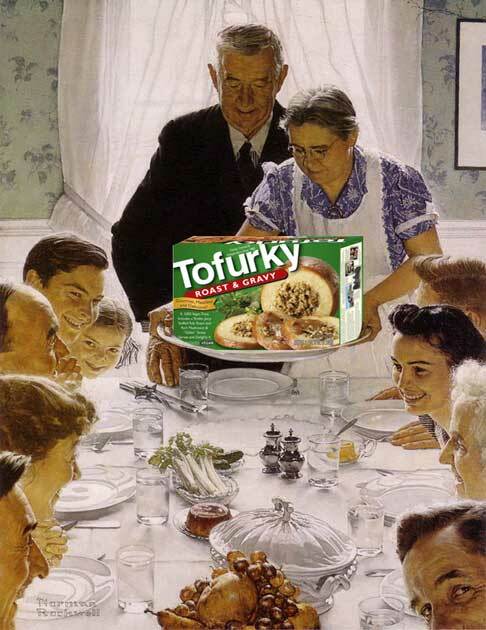 : I have nothing against Tofurky. In fact, the Tofurky products I’ve tried are quite good! The sandwich slices in particular are surprisingly delicious. Do you have a tip for hosting vegetarians on Thanksgiving? Please comment and share your thoughts! Anyway, these are great tips! You know, for about the first five years I was a vegetarian, I felt the same way about meat substitutes. Exactly what you said – I don’t like meat, so why would I want something made to look/taste like meat?! But then I got a little lazy, and I think that happened right around the same time that I’d completely forgotten what actual meat tasted like. So then I started working meat substitutes in occasionally – some of them can be so easy and so satisfying. It’s so much easier to slap a couple slices of Tofurky onto my sandwich when I’m making turkey sandwiches for everyone else, for instance, instead of coming up with a whole new sandwich for me. Like I said, lazy! That is pretty sweet and thoughtful that your families will actually buy Tofurkys for you, though unnecessary! 🙂 My little Photoshopped illustration is made just for you two! Great post! I agree with everything you’ve said. If the side dishes could just be kept in mind when it comes to things like chicken stock, bacon crumbles, etc. It’s so disappointing when I get to a dinner, see that the one thing I get to eat is a green salad, and then realize that there has been bacon tossed in there too. Rolls it is! And as a vegetarian, I love to bring a side (or 2) that I absolutely love. For one, it opens the eyes of anti-vegetarians. and 2, you are sure you get to eat something you really want! Hope you have a fantastic Thanksgiving. Thanks so much, and happy Thanksgiving to you too! i can totally relate, so many of my friends fret when we go out or i come over, as if the world is coming to an end because I don’t eat meat, I find myself conforming to others more often than not due to the guilt, I am slowly trying to convince family that everything doesn’t have to be seasoned with a side of meat to be tasteful, it is still a work in progress…. :( I am home and ate a piece of chicken today… I was tired of eating salad….